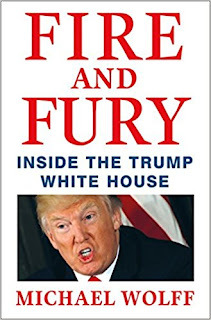 If any one book takes Trump out of office prematurely, it will be this one. 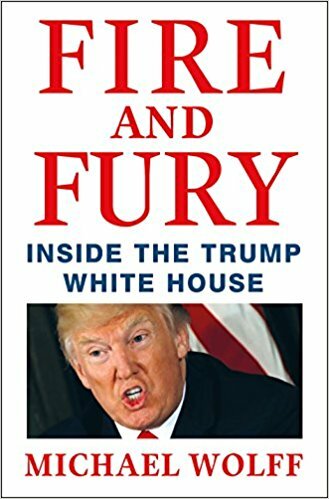 Michael Wolff's "Fire and Fury" is shaking things up, both for its controversial source material and for its stunning revelations about the Trump White House. Some of the "revelations" are facts we already know, like Rex Tillerson saying that Trump is a moron. But other so-called allies can't find nice things to say about Trump's intellect of lack thereof either; Reince Priebus and Steven Mnuchin both said he's an idiot, economic adviser Gary Cohn called him "dumb as sh--," and national security adviser H.R. McMaster thinks he's a dope. Another aide couldn't get Trump to understand the Bill of Rights. Wolff confirms that New Jersey governor Chris Christie was slated for a job in the administration but was denied on the basis of his success at putting Trump son-in-law Jared Kushner's banker father in jail when Christie was U.S. Attorney for New Jersey in the two thousand zeroes. Steve Bannon doesn't look to good in this book . . . to those who like the guy. He apparently had a problem or two - or more - with all those Trump campaign meetings with the Russians at Trump Tower, calling some campaign members "treasonous" and "unpatriotic," adding that Trump had to have known about the meeting involving Paul Manafort, Kushner, and Donald Trump, Jr. Bannon even suggests that the President may have met with the Russians himself, and he even thought that the way Trump handled the Charlottesville incident in August 2017 might have been "25th-Amendment bad," requiring his removal of office due to a loss of sound mental capacity. Trump didn't like that. He's since turned on Bannon, even though many in the administration agree that it is Trump, not Bannon, who, as Trump said about Bannon, has "lost his mind." But here's the kicker: Trump was hoping to lose and planning on losing. The Guardian reports that, according to Wolff's book, Trump "expected to leverage his defeat for wealth, fame and a Trump-branded TV network," and "key advisers wanted jobs in television or politics." How did Wolff get so much access to the Trump White House? They gave it to him, carte blanche, and practically let him wander around interviewing everyone he could find. Trump knew a little about Wolff's reputation and was actually expecting a favorable report. So what effect will Wolff's book actually have? Sadly, despite the first sentence of this blog entry, little if any whatsoever. First, many people found Wolff's sources to be highly suspect, and some of his stories may be exaggerated. Second, even if these stories are completely and thoroughly true, the people who should read this book won't. And, as I wrote in this blog entry from December 2015, Donald Trump, like Madonna, has a knack for maintaining and even increasing his popularity with fans after saying and doing outrageous and offensive things that no one else would have gotten away with. The idea of Trump's opponents hoping for Wolff's book to destroy his Presidency reminds me of us Madonna-haters hoping that her career was through after her movie Body of Evidence tanked. And her cover of Don McLean's "American Pie" was the pop-music equivalent of Trump hypothetically shooting someone on Manhattan's Fifth Avenue.